100% natural, highly stable jelly formulation with major ingredients including astaxanthin, glycosaminoglycans and wasabi root extract. This evening jelly deeply replenishes skin cells with aqua power, nutrients and very potent anti-oxidants to recover from damages caused by exposure to UV rays, free radicals, and various kinds of pollution and stress during daytime. Skin quality is enhanced with improved firmness, clarity and smoothness. Highly stable formulation enables the jelly to resume to its smooth texture in no time, offering a brand new, fresh feeling every time it is used. O’Connor I., O’Brien, N. “Modulation of UVA light-induced oxidative stress by beta carotene, lutein and astaxanthin in cultured fibroblasts.” Journal of Dermatological Science. 16(3): 226-230. *Savoure, N., Briand, G., Amory-Touz, M., Combre, A., Maudet, M. “Vitamin A status and metabolism of cutaneous polyamines in the hairless mouse after UV irradiation: action of beta-carotene and astaxanthin.” International Journal for Vitamin and Nutrition Research. 65(2): 79-86. Once a day. Evening application after cleansing. 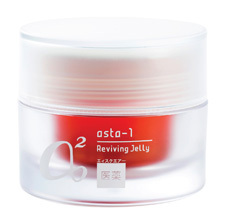 Use asta-1® Reviving Jelly as the last step of your skin care regime. As needed for treatment of dehydration or problems with makeup application.